Spanish cuisine has been making news in recent years. Chefs Juan Mari Arzak and Ferrán Adriá have become household names--in gastronomically oriented households, anyway. It (and “it” is a gross generalization as there are many regions in Iberia whose kitchens wildly differ) is arguably the world’s finest yet simplest cooking. Local ingredients and their astute combination is what it's about. The rediscovery of Spanish cuisine has a political element: during the Franco dictatorship the words 'Spain' and 'gastronomy' didn’t mix. The country was closed, poor and cultural regionalism was frowned upon. The local populous barely had enough to eat. Spanish cooking was promoted for tourism´s sake– but paella, gazpacho, flan and sangría were just about all anyone outside the country knew. Nowadays, everywhere one travels in Spain there is food proudly prepared based on local traditions. Very often a dish will consist of only five or six components, combined and balanced with cunning finesse. A pescado en salsa verde I ordered in a portside Santander bar a few years back brought home this point: a filet of glisteningly fresh pargo, fruity green olive oil, a little young garlic sweated and removed, parsley, and a few cute little white clams for oceanic umami, were so perfectly combined that to date it remains one of the most sublime dishes I’ve ever eaten. So, it is only natural that here in the New World, Spanish-trained chefs have a keen eye for what’s in the market, adapting old-world techniques and recipes to our myriad Mexican ingredients. Chef Pablo San Román arrived 25 years ago from his native San Sebastian in País Vasco, now the hotbed of modern Spanish cooking. His first stop was Baja California where the now highly developed and respected cooking, also based on great local seafood and game as in northern Spain, was in its infancy. For many years a resident of our capital, San Román developed a following at D.O. in Polanco. He insists that 10 or 12 years ago the public was not ready for regional cooking so his early efforts concentrated on more of a pan-español/greatest hits menu—paella, fabada etc., culling the best from the huge lexicon of Iberia. 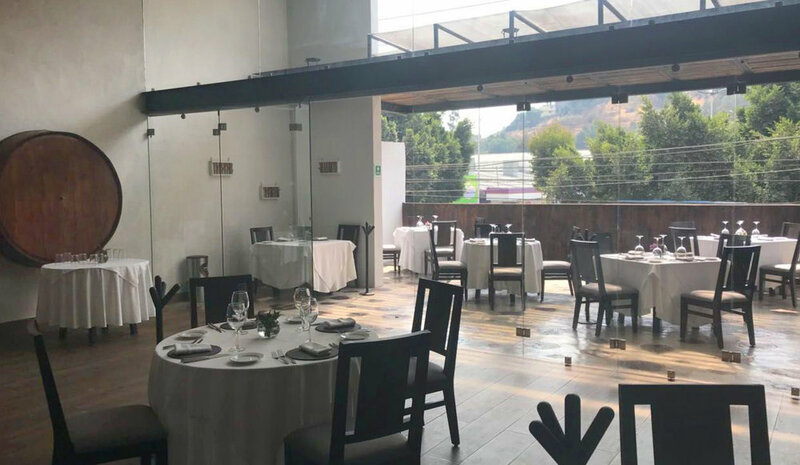 Then, several years ago, he moved on to El Puntal del Norte in an airy modern space near Lomas, which emphasizes fine-tuned dishes from along the northern coast, from Pais Vasco, Asturias, Cantabria and Galicia. El Puntal (see review) is frequented by Spanish expats and their families; quality is high and concepts don’t stray from the original recipes. Now the chef has taken it a step further in his new venue, Ekilore. The geographical range has shrunk: the menu hones in on the chef’s native Basque country. Ekilore, located in the far north of the city, is an ‘asador vasco’ – a type of rustic grill found in the provinces of that area. Its name refers to a local sunflower important in popular lore as a symbol of protection and fortune. “… they asked the Goddess Mari to give them something to repel the spirits of the night and she gave them the ‘Ekilore’ (flower of the sun)” the legend goes. The restaurant is equipped with cider barrels (full of the best Asturian stuff) as well as a special wood-burning oven shipped from the old country. Ingredients are, as far as possible, culled from small producers in our own land. In addition to grilled meats and fish, the menu at Ekilore offers a number of appetizers and dishes associated with the region. Standout starters are sweet roasted pimientos piquillos filled with bacalao or rabo de res (oxtail), callos a la vizcaina (stewed tripe with smoky paprika) and huevos rotos (‘broken’ poached eggs over fried potatoes and serrano ham). Non-grilled main dishes include an extraordinary arroz con mariscos – a wetter version of arroz en paella redolent of the sea, and pescado al pil pil, filleted fish in emulsified olive oil seasoned with garlic. Desserts include a typical cuajada, smoky fermented sheep’s milk that tastes better than it sounds, and panchineta, a creamy almond pastry. The wine list includes carefully selected regional whites as well as reds from riojas, Ribera del Duero and Priorat. The chef concludes that “I can assure that Ekilore will allow us to seek flavors and moments from yesterday, today and forever.” I agree and will soon make the return trek up north.